Markets have been of two minds all week and that trend looks set to continue Friday. Corporate earnings so far this quarter have been mixed, providing little impetus for stocks to add to last year's impressive gains. 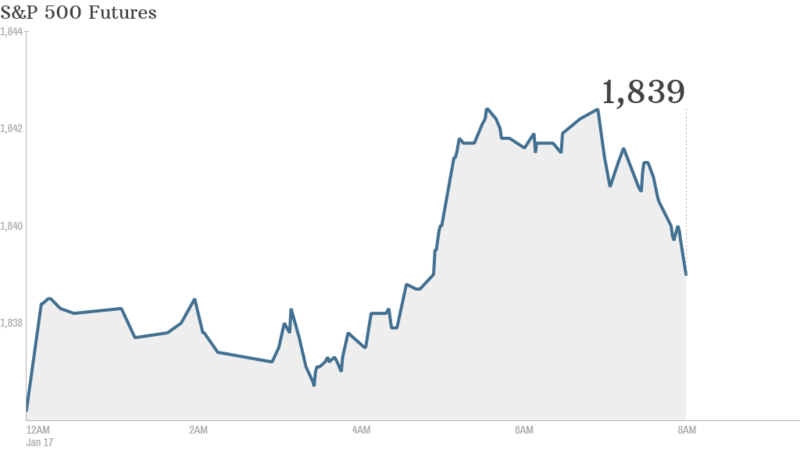 U.S. stock futures were just slightly higher. "It seems markets are as confused as the weather at the moment," wrote Deutsche Bank analyst Jim Reid from Geneva, who also mentioned the "odd" lack of January snow. Morgan Stanley (MS) shares rose in premarket trading after the firm reported a sharp declined in quarterly profit, year-to-year, which it attributed to $1.2 billion in legal expenses. Shares dropped for General Electric (GE) in premarket trading, despite the conglomerate's report of a boost in quarterly earnings. On the economic side, the U.S. Census Bureau is scheduled to release its monthly reports on housing starts and building permits at 8:30 a.m. ET. U.S. stocks finished mixed Thursday. While the Nasdaq closed with a slight gain, the S&P 500 and the Dow Jones industrial average each pulled back. Shares in Royal Dutch Shell (RDSA) were down ahead of the opening bell after the oil company warned that its fourth-quarter earnings would be "significantly lower" than normal because of "weak industry conditions." Intel (INTC) shares sank in premarket trading following quarterly earnings on Friday that missed expectations. "Intel's numbers left investors feeling less than enthusiastic about the group's outlook as the group expects no revenue growth in 2014," explained Ishaq Siddiqi, a market strategist at ETX Capital in London. The main European indexes were edging up in midday trading. Asian markets mostly ended with losses. The Hang Seng in Hong Kong was the only index to buck the trend, rising by 0.6%.